Now we are getting into the swing of 2016, it is that time of year again. 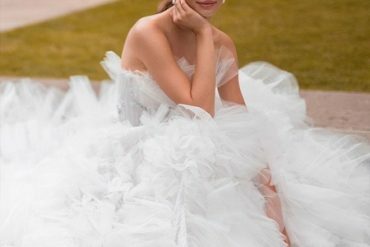 Yes, if you are planning a wedding at any point this year, you are probably going into overdrive with plans and carrying out meticulous research on the latest trends. Now, as we all know, there are plenty of important features that focused on during the planning phase of the wedding; the venue, picking the menu, colour themes, these all demand your full attention. But ladies, we all know that the biggest focus is usually on picking out your dress. It lies at the heat of your dream day. But this sometimes means we forget about some of the smaller details that make up the day! To that end, we have found someone who can give you a helping hand in putting some refined details into the finishing touches. I have discovered this truly amazing collection from designer Luz Kurina at British firm, PJ’sLONDON, who’s sumptuous designs have redefined the idea of nightwear. After spending all day in the dress of your lifetime, you need bridal nightwear to match. PJ’sLONDON’s made to order, handcrafted pieces in 100% silk definitely fit the bill! And even better, the collection also contains beautiful pyjamas (shorts, trousers and nightshirts) you can wear at any point – perfect for all those late night sessions fuelled with hot tea, on Pinterest, finding the perfect centrepieces and invitations planning your big day! I cannot overstate how exquisite each item is, with high quality that feels amazing caressing your skin. A range of 43 naturally sourced dyes also gives a great colour palette to select from. And the small details really complete each piece – you can customize the waistband and neckline finishes, or choose a personal monogram for your pyjama top. My favourite, along with PJ’sLONDON’s regular customers is their signature lace robe. 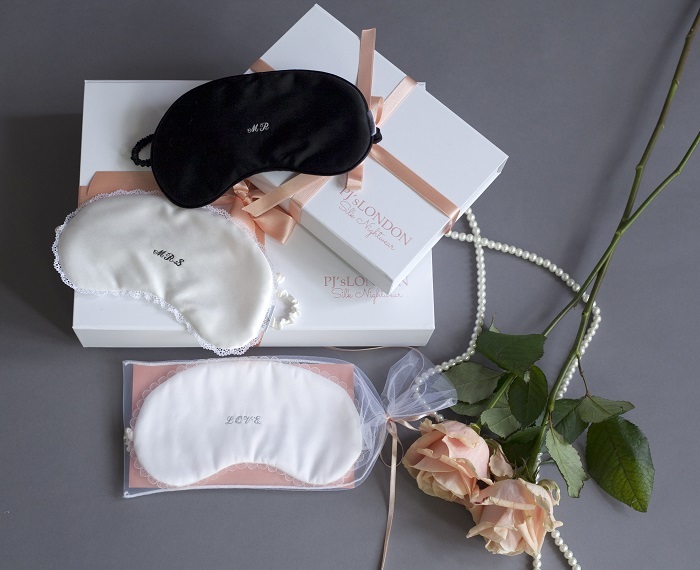 By taking a regular everyday item and elevating it with luxury materials and a high concept design, PJ’sLONDON’s have created something every woman can feel special in. Even if all you are doing is sitting on the sofa catching up on Netflix. Or, basking in the glorious glow of your honeymoon! The wedding shows and exhibition season has kicked off now, and the Luxury Wedding Show 2016 was held at the London Hilton Park Lane on Last Sunday, 21st February. Whilst I was lucky enough to get an invite, I was unfortunately unable to go as I was on holiday with my kids due to half term. However, Luz Kuzina was there to show off PJ’sLONDON’s latest collection and answer questions about her inspirations. To find out more about how she creates beautifully bespoke items that function in everyday life to add a touch of glamour in any girl’s evening, read an interview with the designer here. 1. What inspired you to design pure silk nightwear? What’s the story behind the collection? I love the elegance and simplicity silk brings to each garment. Working with materials that I love, gives me a wide spectrum of ideas and inspiration in itself. I don’t make collections but try to create pieces that can be worn many times for many different occasions, so I offer a bespoke service. Everyone is special and I love uniqueness! 2. What is your favourite part of being a designer? The process. My work is an extension of myself, something I truly enjoy doing. The colours, the fluidity of the silk, the many combinations each person can create with each garment is amazing and I love it from the very beginning until the very end. 3. What more can you tell us about PJ’sLONDON? Our pyjamas are more than just garments. It’s the love and dedication each pyjama takes to be made where all our time and effort goes, because we want our clients to be very comfortable and fully satisfied with the products. Attention to detail and listening to their requests is our top priority. 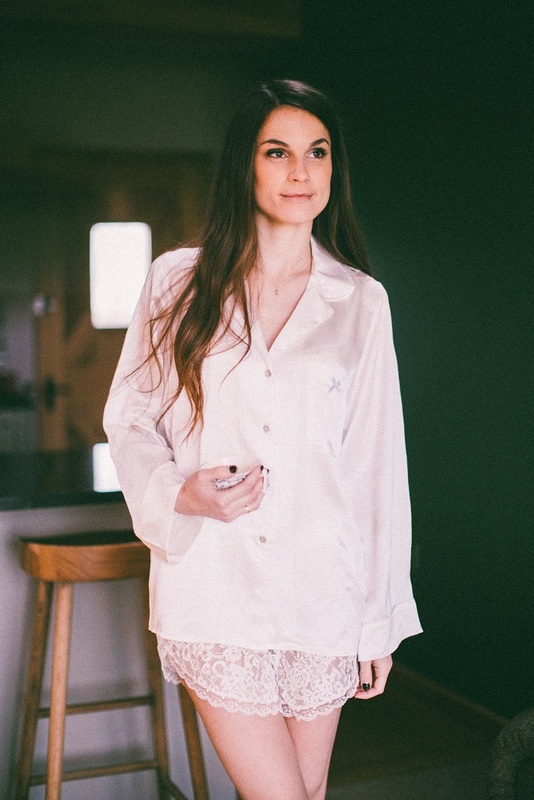 We want to offer them the possibility to look the way they want and each handmade and bespoke pyjama gives them the choice of selecting every detail from fabric, colour and finishing touches such as the neckline, sleeves and monograms for a truly special piece of lingerie to wear on your wedding day, your honeymoon or just around the house! 4. Your fabric selection are so pretty. How involved were you in each step of the design process? From beginning to end I am involved in the process of each pyjama. From sketching, drawing the patterns, cutting and sewing. The fabrics on the other hand, are painted per order by experts in the UK. It’s a small, traditional family-run company and I love working with them. 5. What advice would you give to a bride? Advice selecting their sleepwear for their wedding day or honeymoon? Your honeymoon is the private celebration of a further step/commitment in your relationship so it’s as special as the wedding day itself. Just be yourself and wear beautiful sleepwear that makes you feel absolutely fabulous and comfortable, it will radiate*! With custom nightwear starting at £200 a piece, PJ’sLONDON offers something special for every woman. You’ll find more information about PJ’sLONDON‘s website plus you can also connect with the team on Instagram, Pinterest and PJ’sLONDON‘shop online on Etsy.